"This is an amazingly good-for-you salad, packed full of fiber and nutrients to make up for any cheating that might happen on the weekend! The best part is that you can really have fun with it by adding a variety of ingredients (ground flax, black beans, sausage, nuts, peppers). Have fun with it and please your palate! It's great for breakfast, but could easily be eaten for lunch or dinner as well." Combine cilantro, olive oil, garlic, red wine vinegar, jalapeno, salt, black pepper, and red pepper flakes in a food processor. Pulse chimichurri sauce until well blended. Combine water and apple cider vinegar in a small saucepan over medium-high heat until bubbles form at the bottom of the pot but not yet simmering, about 140 degrees F (60 degrees C). Crack egg into a bowl carefully without breaking yolk. Slide egg into water and set a timer for 4 minutes. 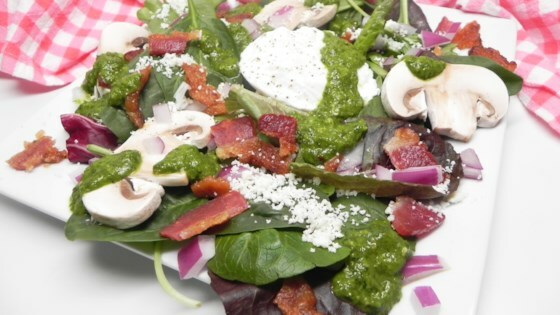 Place spinach, bacon, feta cheese, mushroom, sunflower seeds, and red onion on a serving plate. Carefully scoop poached egg from the water using a slotted spoon and place on a paper towel-lined plate to absorb any extra m moisture. Transfer egg to the salad and top with desired amount of chimichurri sauce. Season with salt and pepper. Feel free to use arugula or mixed greens in place of spinach. Any kind of mushroom will do. Save any extra sauce for tomorrow's breakfast, tonight's steak, or this afternoon's pasta.